Educational success: does the building matter? School Building magazine this month featured an article from Chris Keates, General Secretary of the NASUWT, the UK’s largest teachers’ union, which puts forward a robust case for significant investment into the UK’s school estate. Ms Keates points to the ample research identifying the correlation between the quality of school buildings and student attainment, behaviour and wellbeing. School infrastructure has an effect on attendance and dropout rates as well as teacher recruitment and retention. It’s not surprising that success and happiness increases for people in pleasant environments which meet their needs. But how can we help? 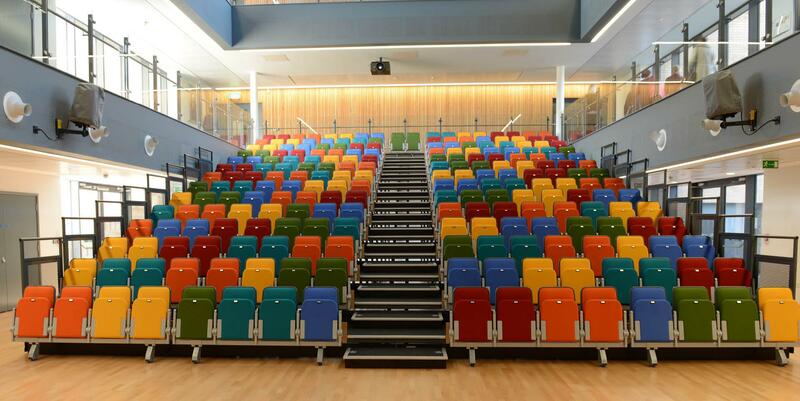 Our market-leading retractable seating systems mean that spaces can be truly multi-functional: an exam hall can be transformed into a performance space within minutes, a sports hall becomes an assembly hall at the touch of a button. Our engineering expertise affords optimum seating capacity. Collapse the seating unit to give maximum space. The swift, easy system reduces set-up time and effort for site teams. Audience Systems, aware of the benefits a retractable seating system brings to schools and the wider community, but also the fact that budgets are frequently tight, have a range of chairs to suit differing budgets and needs which sit on our retractable system, offering contemporary, durable seating on a system which will enhance the learning environment and offer significant functional benefits. Why Audience Systems? We’re the UK’s market leading provider of retractable seating solutions because our systems offer astonishing lifetime value. Many of our retractable units are still in place and fully operational after 2 decades of reliable service. Our chair range is designed to meet the highest British standards for strength and durability while not compromising functionality or beauty. Given the critical impact of education environments and facilities, Ms Keates’ conclusion is not whether we can afford to invest in schools, but if we can afford not to. We’d agree: invest wisely in functional solutions which contribute to school improvement for years to come. Our young people and the professionals who educate them deserve, and will perform better in, an environment which is pleasant and fit for purpose.